I will respect and obey my parents. I will exercise everyday to be stronger. I will hand in my homework on time. I will be kind to my younger brother. I will donate to the poor. 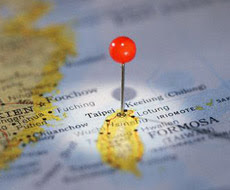 I will help my father to stop drinking and stop smoking. I will always throw the trash in the trash can. I will use less time to play computer games. I will get up earlier. I will save 10 dollars everyday. I will review my homework every day. I will eat more, exercise more and grow taller. I will train myself to be a runner. I will use good manners. I will help my father stop smoking. I will help my parents do the housework. I will hand in homework on time. I will not make my grandmother angry. I will not be afraid of ghosts and sleep alone. I will be a singer and a dancer. I will make big progress in my studies. I will save money to buy a big dog. I will help my friends and make them happy. I will go to sleep earlier. I will find the one I love. I will not lose my temper. 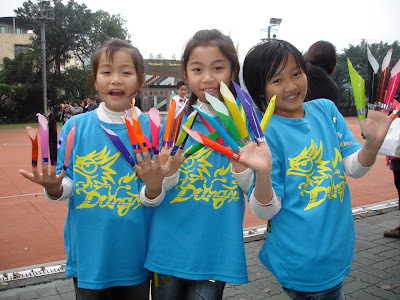 On December 29, Dung Xin Elementary School celebrated the end of the year with its annual concert and class performances. Students and their teachers worked together to put on a great show! 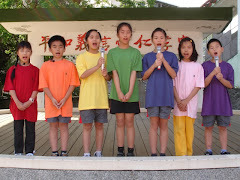 You can view the afternoon class performances at our English blog or at our Dung Xin Youtube channel. 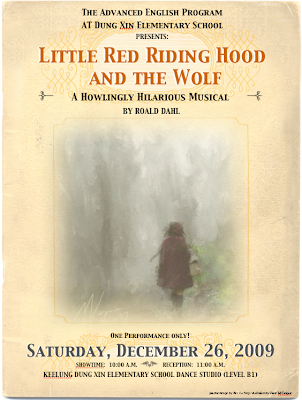 AEP Musical "Little Red Riding Hood and the Wolf"
This Saturday, December 26, our AEP (Advanced English Program) students will end their year with a celebratory performance of "Little Red Riding Hood and the Wolf -- A Howlingly Hilarious Musical." Adapted from the works of famed children's author, Roald Dahl, this delightful musical combines the music, performance, art and English language skills that our students have studied every Saturday morning for most of this year. 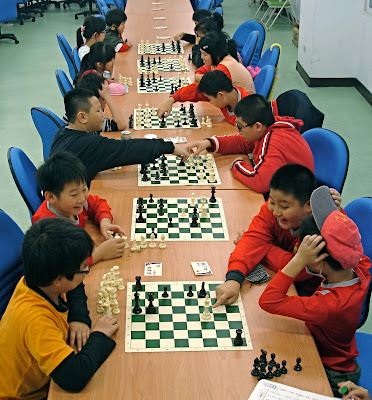 The show will conclude the end of a year long effort by students and teachers from across the Keelung elementary school system. Please see the Chinese text below for your invitation to this one performance only. 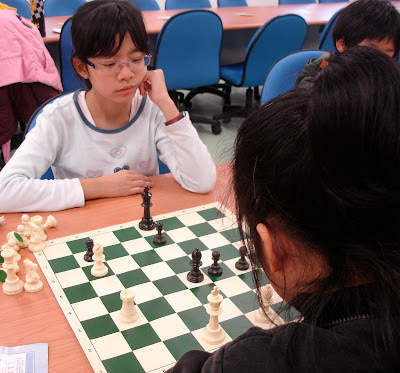 Students met for the last chess club session this week. 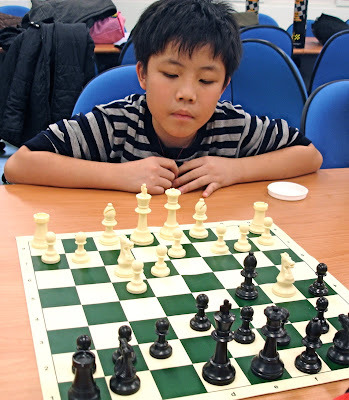 This term, Alex taught the basics of the game: setup and initial positions, names of the chess pieces, their movements and relative values and an understanding of check and checkmate. The students were surprised and disappointed it was the last session for this year, but look forward to meeting again in the new semester. 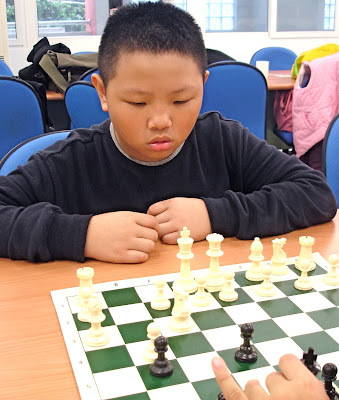 In February, we will study good opening moves, learn when it's okay to sacrifice material (chess pieces) in order to win the endgame, and learn how to avoid draws or stalemates. 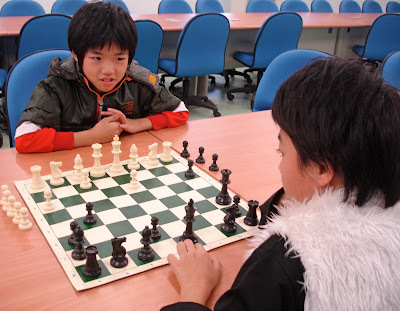 For an overview (in Chinese) of the basics of chess, visit this children's chess club webpage. 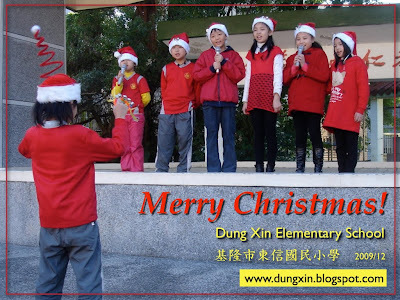 Grade 4 students at Dung Xin Elementary School perform "Jingle Bell Rock". 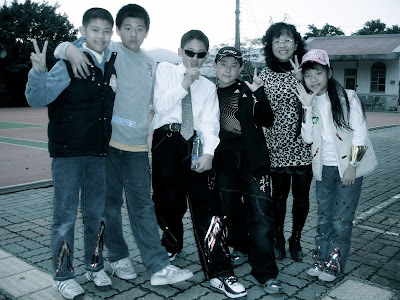 Thanks to the students of Class 407, Emma She (施旻萱), Justin Huang (黃秉家), Peter Xiao (蕭竟由), Yummy Hong (洪亞妤), Kelly Chen (陳怡妏), Shirney Wang (王翊萱), and Vicky Lin 林庭瑄, for singing so wonderfully for the whole school.